"What ! Cigars in an RYO Issue"
The idea of small aperitif-style cigars, while not new, has certainly been getting increasing attention of late. As a matter of fact, there are now several dozen credible cigar makers offering these small treats. They usually range in size from 27 to 32 ring gauge (a measure of circumference in mm) and less than 5" in length and generally come 8 to 10 to a package. These gems are not to be confused with cigarillos or the cheap supermarket version of cigar wannabe's. No, these are indeed the real thing with often as much flavor and sophistication as their larger counterparts. Often they are hand rolled and wrapped as carefully as their larger counterparts, though most of the filler consists of "leavings" from rollings of larger more expensive product. Now, I have been a fan of good cigars for some time and, though prices and taxes are making this minor diversion of mine increasingly difficult to justify, I still manage to smoke one or two a week. When first introduced to the smaller offerings I was admittedly skeptical, having tried such things as Swisher Sweets and various wood tipped cigarillos that one commonly finds in markets. Prejudice notwithstanding, I was given a tin (most come in very nice colorful and useful tins - again, eight or ten cigars to a tin) sometime ago as a present and I put them away intending to try them later. Finally, a few months ago after letting them remain "misplaced" for a month or so, I decided to try them just to satisfy my curiosity. The Cuesta-Rey tin (shown at left) was certainly attractive but I had no clue as to the enjoyment I was about to experience. This little smoke is very mild and very tasty. It smokes like a real cigar, meaning that it doesn't burn up in the ashtray like a cigarette and has a very nice flavor. Inhaling a Phillies Cheroot or other such cheap sticks will certainly provide a most unpleasant reaction. The Cuesta-Rey Cameo on the other hand was very smooth. While I rarely inhale much cigar smoke deeply, the little that drifts in through the nose and mouth in the normal process of cigar smoking had none of the harshness I had come to expect from small cigars. 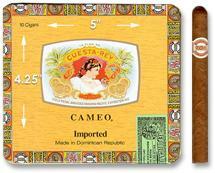 The Cameo is of typical size (see right) with a completely finished cigar look and wrapper. The construction is excellent. They last a good hour of casual puffing and chewing and taste great even when they get short or go out. Needless to say, after this experience with the Cuesta-Rey, I was eager to see what else was out there on the market. Considering price and the fact that often I rarely have time or am in the environment where I can enjoy a full sized cigar, AND if this little treat was any indication of what else may be available, I began looking around for other brands. To my surprise, several upscale cigar makers make a similar product. (By upscale I mean the Cadillacs of the industry - Cadillac as opposed to Ferraris.) Partagas, Punch, Ashton, and Macanudo to be specific. 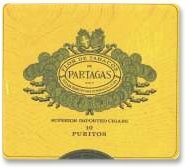 The Partagas Puritos, while a slightly stronger offering is extremely well made and satisfying. Almost identical in size to the Cameo, this is a first quality smoke with much of the character of the larger often excellent Partagas line. It still continues to amaze me at how much enjoyment I experience with these size smokes. 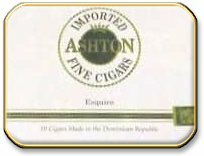 Punch, another one of the finer upper-medium priced cigar brands also makes an offering in this category. It is called the Slim Panatella and while it is a bit smaller in diameter and a bit shorter, it nonetheless has a full sized character. Now, if you like forcing your jaw out of its natural position by filling your face with a big diameter stogie these probably will fall short of your expectations of the whole chewy ambience of cigar smoking. But if it is flavor, economy and convenience that you seek, these are true winners. I mean DAMN good smokes. The Honduran/Dominican Punch is a little stronger than the Cameo, less so than the Partagas but very aromatic and nutty. Smells like an outdoor baseball game in summer - if expressed in less than aficionado terms. 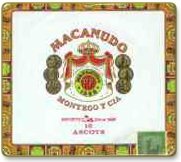 Of course Macanudo, perhaps the most popular premium cigar in the US, also makes one called the Ascot. At 4.25" by 32 ring, it is also very mild and we're told can be had with the natural (light brown) maduro (dark brown) or the claro (green) wrapper. This smoke was every bit as good as the others, yet with a taste that is distinctively Mac. We have found these particular small cigars pretty easy to find as nearly all decent smoke shops carry the Macanudo line. Prices on these vary as do with all the small cigars but expect to pay between $15 and $20 for a ten-cigar tin, which means about $2 a piece. While it is possible online to find a number of pretty good full sized cigars at close to the $2 price, with local taxes being what they are in most states (our Editorial this issue covers the specific tax in each state) even cheap cigars can get pricey from local vendors. Of all the small ones we have tried, this is one our favorites as they seem to have a truly sophisticated big cigar taste and burn rate but more importantly the fragrance seems to be more acceptable to those who don't particularly like the smell of cigars, you know some women and most dogs. The Shimmelpenninck Duet is a much longer though thinner 5.25" x 27 ring small cigar that is considerably lower in price than those above. They are pretty darn good and though they don't last much longer than their shorter competitors, as they tend to burn faster, nonetheless they do the job intended which is to give you a reasonably okay taste in a manageable amount of time and space. Bering cigars found their niche long ago as an alternative between truly bad, cheap supermarket-quality cigars and more the expensive premiums found only in cigar shops. They practically invented the metal tube for low priced cigars which has helped their image and performance tremendously. Their small cigar entry is called the #8 and, as expected, reasonably priced and quite good. They burn a little quickly but the flavor is rich and considering the price, fairly complex - and they are pretty easy to find. The Honduran nature of the tobacco is evident as they are not particularly mild but many people don't particularly want a too-mild short smoke. For those who like a good kick and want to economize, these may be just the ticket. H.Upmann cigars tend to be pricey and have never been one of my favorites because of that. I have had some great ones and they do have a reputation for making consistent sticks. They just always seemed a little over-priced for the ride. One of the nice things about all of these little cigars, especially the ones made by the more expensive manufacturers, is that it affords the smoker the opportunity to sample at least a hint of the product that these folks produce. This is not to say that these little offerings taste just like their larger siblings, but one can taste in the good brands the differences that make each of these makers distinctive. The Upmann Aperitif's 4"x28 ring are a little smaller than most of the others but have a very good flavor and burn with a leisurely pace so that each stick can be appreciated for some time. There are a number of other good cigar makers who make little cigars, or cigarillos at least. We tried to show you the ones that come in tins because we feel tins are cool. They add convenience and flair to the whole experience. There are bargains out there for "seconds" and "overruns" for these kinds of smokes just as there are for full-sized cigars. One should be aware that it is not unusual for so called name brand "seconds" to be counterfeit knockoffs. So, the buyer must remain vigilant and thoroughly trust the seller of such merchandise. Most "seconds" come unlabeled and in larger boxes so you won't get the cool tin but if you already have the tins from previous purchases, using the 'seconds" as refills makes sense. There is one place we know of online that specializes in the small cigar market. 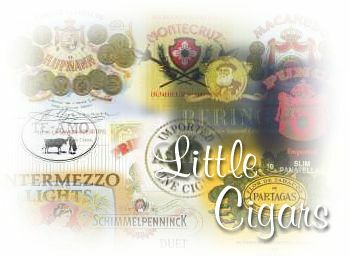 www.littlecigar.com This site allows you to buy one pack at a time at a reasonable price so that you may try many brands and find the one that best suits your taste. Once you have it fully in mind what you like, the site www.newglobal.com has the best prices on bulk packages of these tins, usually ten-packs of ten cigars. We finish this section with a new find that may just be the best small cigar around. 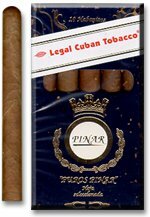 The brand name is Pinar and they are about the same size as the others mentioned here. They claim to be made from "Legal" Cuban tobacco. Now, how this is possible I have not yet been able to determine, but I must admit that the flavor is very Cuban in nature. Strong, robust with a great atmospheric quality that really makes a nice presentation. They are somewhat less expensive than many of the others reviewed here. They come in a cardboard pack rather than a tin, but considering the flavor, who cares! Now these little rockets sound like a real winner but few people know about them and we know of only one place online that sells them. That is Cascade Cigar & Tobacco. ( www.cascadecigar.com ) We recommend them highly and probably would prefer them over many far more expensive and even larger smokes. Please keep in mind that, although in most cases internet prices are far lower than your local outlet - who is forced to pay their particular state's tobacco tax - by law you are responsible for paying that tax if you bring cigars into your state. The law is clear but enforcement is very weak at this point. 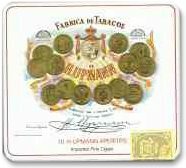 There is some concern by many who fear that, in the future, cigar and other tobacco sellers who do sell online or by mail order will be forced to submit sales records and lists of clientele, and if that happens, you could wind up owing the tax on all previous purchases retroactively. Check your state's website under the Revenue Department's section dealing with tobacco for more information. Better yet, write your representatives and encourage them to repeal prohibitive and inequitable tobacco taxes. - the ed.